Like a blast from the past, Debbie arrives with the most 90's looking outfit of them all and it makes sense since she was 16 years old when the show first aired in 1998, which means she was born in the early 80's and had plenty of time to get that 90's grudge fashion rubbed onto her. Her daily outfit consists of a green plaid shirt with long-sleeves rolled up to her elbows. An orange, crew neck crop top and really baggy, distressed blue jeans. Let's not forget her black oxford, lace-up shoes. Though she's been spotted wearing a couple of different hairstyles, she's better known to wear her long, curly, blond hair loose with peek-a-boo bangs. Also of interest, this moody teenager loves her black eyeliner and her burgundy matte lipstick. 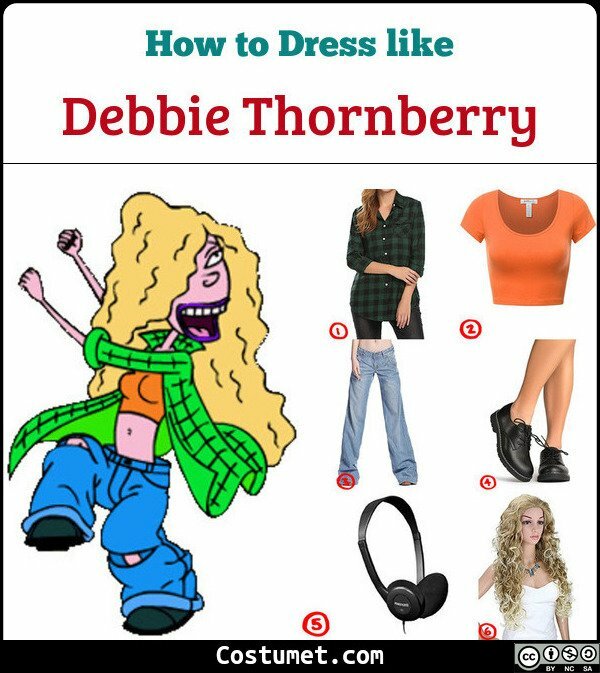 Elements you should keep in mind when putting together your Debbie Thornberry costume. 1 Green plaid shirt To make it a 100% accurate, you should aim for a dark-green, long-sleeve, plaid shirt with windowpane pattern, but if you don't feel like searching through the whole store for one of these, you can just wear a dark green tartan long-sleeve shirt. 2 Orange crop top Try to find and orange, crew-neck, crop top t-shirt for this costume. A little short on time? Just take an orange t-shirt a cut a few inches off the bottom and voilá. 3 Baggy blue jeans To this day, there's no science that can explain how Debbie could hold these pants up without using her hands. When looking for these blue jeans, try to get them as baggy as possible. Also, cut an opening on each knee to better replicate the ones Debbie used to wear. 4 Black, lace-up, Oxford shoes This wouldn't be a proper 90's grudge look without the black Oxford shoes Debbie wears everyday. Anything close to these lace-up Oxford shoes will be perfect. 5 Headphones As an accessory, you could put on these classic headphones and look like the distant and indifferent teenage girl Debbie was. 1 Long, curly, blonde hair Naturally long, curly, hair would definitely be helpful for this one, then all you'd have to do is comb your bangs to the side into a peek-a-boo hairstyle. If that doesn't sound like you, worry not. The wig suggested in the link meets all of those characteristics. 2 Burgundy, matte lipgloss This is key. Not a day goes by without Debbie wearing her burgundy matte lipstick. 3 Black eyeliner Just add a thick flick of eyeliner like they did in the 60's, and you will have added the last detail to your Debbie Thornberry costume. Debbie is the oldest of the Thornberry children. She's a moody teenager, distant and indifferent, but she loves her family in a very personal way. Traveling the world and going to exotic places sounds like the dream of many teenagers, but not to Debbie, the 16-years-old longing for a normal life. She just wants to experience what an average teenage girl is all about. Going to a normal school, make friends, learn how to drive and go to concerts. She spends most of her day reading teen magazines, listening to music or trying to catch up with world trends and yet, she's got her share of adventure. At times, she's been caught in the middle of life-threatening situations with wild animals and even dangerous people. Debbie is the only human besides, shaman Mnyambo, who knows about Eliza's secret ability to speak to animals and she must keep that secret or be turned into a baboon. To dress like Marianne Thorberry you'll need dyllow vest, blue jeans, olive green, lace-up boots, a red bandanna and oval reading glasses.